Saburo Sakai, a Japanese fighter pilot in World War II who said he shot down 64 Allied planes, including one of each type the United States flew, but who later befriended the Americans he once fought, died in Tokyo on Sept. 22. He was 84. Mr. Sakai was dining with American military officers at the Atsugi Naval Air Station west of Tokyo and suffered a heart attack as he leaned across the table to shake hands with an American; he died later in a hospital. Mr. Sakai had visited the United States a dozen times, sometimes meeting convivially with American pilots he had confronted in dogfights. Mr. Sakai came from a family descended from Samurai, Japan’s ancient warrior class. He was taught to live by the code of Bushido, which he defined in his book, “Samurai!” as living so as to always be prepared to die. Flying the legendary Zero fighter plane, which for the first years of the war was considered the best fighter anywhere in terms of manoeuvrability and range, he was wounded four times. Of the 150 pilots who began in his unit, only 3 survived the war. His score of 64 planes downed is based on his own reports, and in some of his accounts it was one or two lower. Two Japanese pilots had higher scores, also based on their own counts. (Lieut. Tetsu Iwamoto shot down more than 100 Allied planes.) The Japanese Navy policy was not to credit personal victories officially, but to subordinate the individual to the group. Saburo Sakai was born in Saga, on the island of Kyushu, in 1916 to a family that had turned to farming as changing economic and social conditions led to the passing of the warrior class. The family was poor, but intensely proud of their Samurai heritage, according to Mr. Sakai’s book. And as Japanese militarism surged in the 30’s, so did the popularity of the old Bushido ideology. A poor student, Mr. Sakai joined the Imperial Japanese Navy at 16. He endured the brutality of the petty officers and advanced in the service until he at last passed the competitive examination for the navy fliers’ school. He was one of 70 to be accepted from 1,500 applicants. Twenty-five of these graduated as pilots, and Mr. Sakai was first in his class. He was sent as a combat pilot to China, where he was wounded. After recovering, he flew the new A6M1 Zero over Indochina in support of Japanese troops on the ground. He was one of the first to test the Zero in combat against the Chinese Air Force. On Dec. 8, 1941, the day after the attack on Pearl Harbor, he flew with his group to attack an American air base in the Philippines. He shot down an American P-40, in what was said to be the Japan’s first aerial kill there. On Jan. 25, he downed an American B-17, the first Allied bomber to fall in the Pacific. But somehow he made it back 560 nautical miles to his base in New Guinea. In 1983, he met the tailgunner who hit him, Harry L. Jones of Unionville, Nev. “I thought he was gone,” Mr. Jones said. The two enjoyed conversing, the Los Angles Times reported. 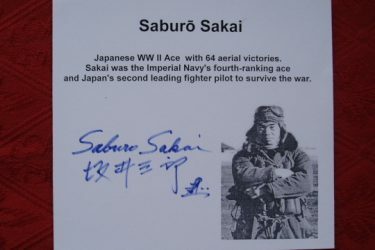 Mr. Sakai spent five months in the hospital, instructed other fliers and returned to combat. He believed a bomber he shot down around the time of Japan’s surrender may have been the last American plane downed in World War II. Mr. Sakai was one of the few Japanese servicemen to rise from the ranks of enlisted men to officer. He retired with the rank of lieutenant. According to reports, Mr. Sakai became a lay Buddhist acolyte as an act of atonement. He said that he had not killed any creature, “not even a mosquito,” since last stepping from the cockpit of his Zero on a hot August day in 1945.